The NGO, or non-governmental organization, has made it to the forefront of well-intentioned photojournalists' minds these days hoping to change the world with their photography. Photographers get the opportunity to travel to far-away lands, usually in the third world, to document the plight of a population, region, or other disenfranchised group. The photos are immediately turned into online galleries and printed materials for fundraising purposes to bring in more money, ostensibly, to do more good. In a short period of time, a photographer can see their images doing good. many a desperate freelancer is looking to organizations to save them these days, and photojournalists think it's the NGO. So, first, what - really - is an NGO? PBS defines an NGO as "A nonprofit group largely funded by private contributions that operates outside of institutionalized government or political structures. 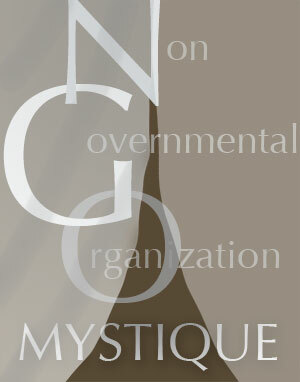 In general, NGOs have as their agendas social, political, and environmental concerns." The US Chamber of Commerce defines an NGO as "A group or association that is not directly part of a government body and that seeks to affect change for a specific cause or activity not commercial in nature. In many cases, NGOs operate for a charitable purpose and rely on donations from individuals, corporations, and foundations in order to operate." Are all NGO's charitable organizations? Well, their work may be charitable, as the USCC notes, however, their tax status may not be one that qualifies a donation to them as tax deductible. Further, as a photographer, your work for them is not tax deductible, except for your actual expenses. So, supposing you shoot for a week for them, and burn them a CD with your images. The $0.50 cost of the CD is all that would be deductible, unless you had other receipts for expenses directly associated with that work. As you contemplate how you would (or if you would) charge an NGO for your photography services, consider this - according to SimplyHired.com (here), the average NGO CEO earns $97,000 a year. The reality is that NGO CEO's can far and away exceed that, getting to over $250,000 or more. NGO's often have offices in downtown areas, where costs can be $65.00 per square foot, per month. Look around your home, and let's say it's 1,000 square feet. That equates to $780,000 a year just in office space costs. Is your potential NGO client working in a downtown office building, or a one room apartment complex? If they have 47 employees in an office in downtown Manhattan, should they be asking you to work for free, or paying you a pittance? The simple reality is that NGO's are just businesses, and they look appealing to work for, because their business is helping people. NGO Watch is one resource for you to do your research on an NGO, but there are many others. Where does their money come from? How much covers salaries/staff/office rent/overhead, and how much actually makes it out to the target beneficiaries? How much accountability and transparency is there at the NGO you are considering doing an assignment for? 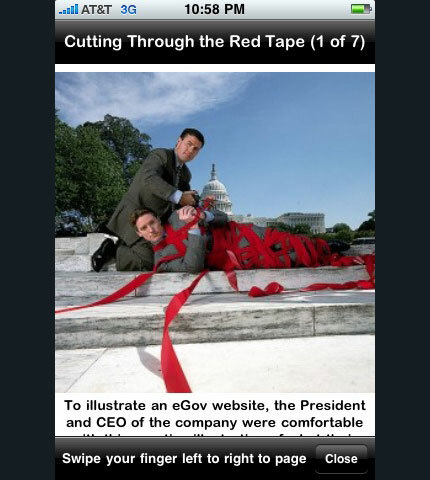 Here you can learn more about what's going on with these issues, as just one resource to review. Yes, no less than Ansel Adams was concerned that "documentary photography" was almost always propaganda, and he was right. 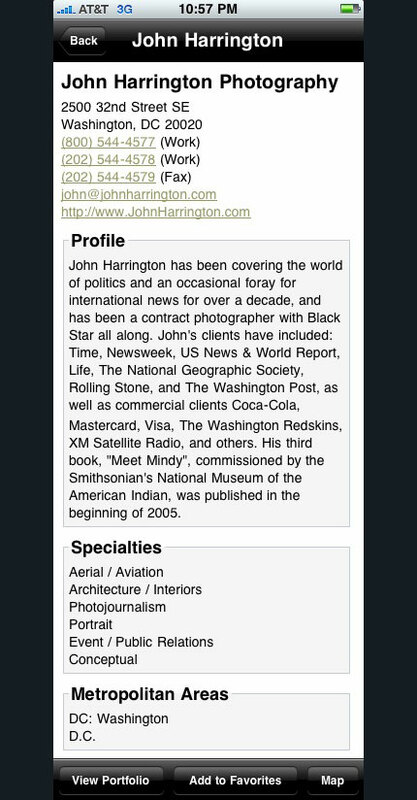 Working for a newspaper or other legitimate news outlet, you get sent somewhere to cover the story. Hopefully, you will come away with great images from a great story. However, from time to time, the story wasn't there, or didn't pan out. The plight was not as severe as was first thought. However, when you're working for an NGO, your images must illustrate, with great intensity, the work that the NGO is doing. The difference that the NGO is making. Thus, if only there was more money/funding/time, more of a difference could be made. You go with a mission - to tell - in as vivid a manner as possible - the story of the good that the NGO is doing. This is NOT documentary photography - this is activist photography, also known as propaganda. This is not to say that you have manipulated an image, or, per se, that your image has lied. However, it must be considered that if you are not telling the whole truth, then to what degree are you lying? The minute you as a photographer slant your perspective from neutral observer to purveyor of propaganda, you need to realize you are no safer against challenges of having a political agenda than Fox News or CNN. In addition, it is important to consider what expectations are made of you when, as a journalist, your only avenue into a country is via an NGO trip. Occasionally, as was the case with the Congo awhile back, the only way in was with one of the United Nations NGO's on their flights. In the travel/tourism trade, this would be called a "familiarization trip", or a "fam trip", where the visit is carefully orchestrated so that the travel journalists get to see the best - and only the best - of the destination. Is this only avenue into the country just an inbound and outbound channel, and you are free to "do your job", or are you shepherded around by the NGO? IF your trip is to see how an organization is making a difference, that might be one thing, however, if your trip is to get a real sense of what is going on in that country, you likely won't see everything you need to make an honest and balanced assessment of the situation. As NGOs are becoming the object of desire for photojournalists with a story to tell, you must be careful about giving away your creative talents. It's one thing to donate your time doing physical labor, where, once you stop the heavy lifting, your assistance pauses. However, to donate your intellectual property is far and away a much bigger deal. NGOs need to understand that even if you give them the right to use the photos on their website and in their newsletter, those images can't be used in advertising or be sold, without your permission. NGOs must be educated about the value you bring to the table, and your contributions. Discussions about how great photography can really tell the story - honestly - to possible donors, is key. One or two images can seal the deal on tens of thousands of dollars to be given in a single donation. It's okay to want to change the world, or make a difference, through your photography. However, the key is to keep a close watch on the integrity and honestly you bring to the coverage, as it can be easy to cut a corner here and there. If you're not careful, that four-square of integrity could end up looking more like a circle. Further, if you are not charging a sustainable fee for your creative talents, you will have a limited ability to make a difference over time. How unfortunate would it be if your talents were not properly compensated as a photographer, and thus, it wasted away while you waited tables to pay your bills? Establish, through research, what your fees would be for an NGO that is multi-national and national, or where the CEO and entire board are volunteers. Be sure that, while the NGO may have rights to the images for specific purposes, that you retain all rights to the images for your own use. If an NGO tells you that everyone you will be photographing will have signed a model release, be sure to include in your contract that the NGO conveys to you all of the rights that they were granted in those model releases as a part of your contract - and get a copy of the model release for your files (or preferably, all of the signed ones, if possible.) Get signed releases if you can, as you go - and be sure they are in the local language, and have both the local and English versions on the form. When I travelled to Japan for an assignment, I had my releases translated before I left into Japanese. Getty Images has a great collection of translated releases here that is worth a look. David Burnett astutely notes in his blog here on the matter of model release shady practices "Steve McCurry’s picture of the Afghan girl was perhaps the most famous of these: the haunting blue eyes, taken in a camp as part of a bigger reportage, and as he didn’t have her name she became the iconic, nameless beauty of a refugee, only to be found nearly twenty years later. A good attorney could have easily wrangled a seven figure settlement from the Geographic, as they had used her image on everything from advertisements, tip-ins [the annoying little subscription cards that fall out], posters, the list just goes on and on." Does it smack to you of commercialism that you, the journalist - the documentarian - must obtain these legal documents, so the organization can use the images in ads and marketing materials? If so, then that should give you some indication that your images are worth more than a pittance, and you should be paid fairly when you are called upon to shoot an assignment for an NGO, or even a non-profit. One of the first things that McCurry is said to have done is secure a retroactive release from the Afghan girl. He recounted in a presentation I saw, about how he had to be careful how much The Geographic compensated her because of where she lived and how that would be mis-perceived by her community. He indicated that she and her family have enough to be well taken care of for a very long time. Keep in mind, as you contemplate the NGO as the unfettered answer to your documentary dreams of changing the world with your images, that an NGO is a business, and you are a business. They must compensate you fairly for your efforts, so you can remain in business. In the end, their business is helping people, and yours is to make images. 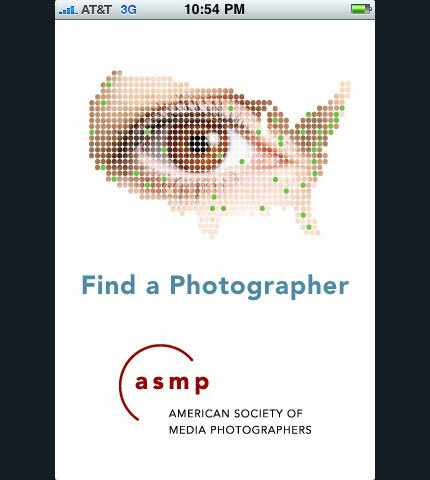 Once downloaded (for free), the entry screen, with the map of the US attractively integrated with an image of an eye (courtesy of Hermann+Starke) and the ASMP logo is the first indication that this is a clean and professional application. 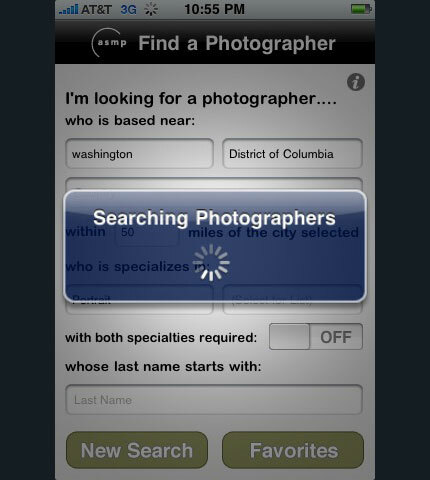 Clicking "New Search, connects, in real-time, to the ASMP database, searching for photographers that meet the criteria. Here, the search results are returned. In this search, I am the fifth listing. I can't discern how the listing results order is determined. It's not alphabetical, and multiple searches for the same specialty returned the same results, so it would be interesting to learn how to optimize your listing to appear higher. 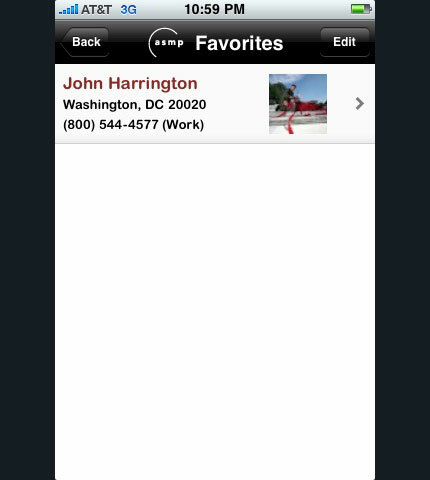 By clicking in the photographer's entry, their contact information, and profile comes up, scrollable in my case, since the profile is longer than one screen. 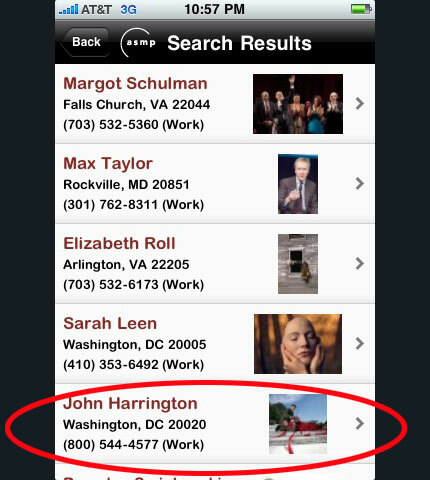 Clicking on the "View Portfolio" button at the bottom, and the images are loaded, again, in real-time, from the ASMP member directory online. 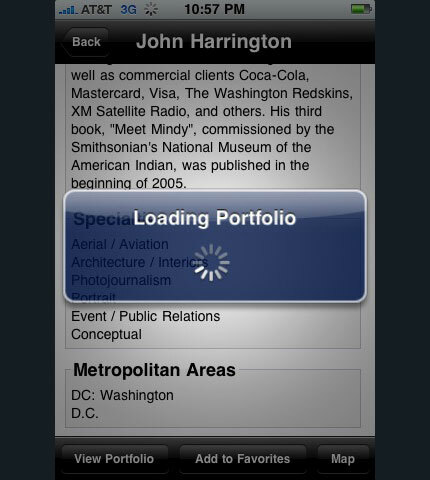 Once loaded into the app, you are able to browse/view images in the portfolio just as easily as you would browse images in your own photos application, and your captions are included below the image. Once you close the portfolio, at the bottom of the photographer's listing, you can click "add to favorites", and here's the favorites listing. 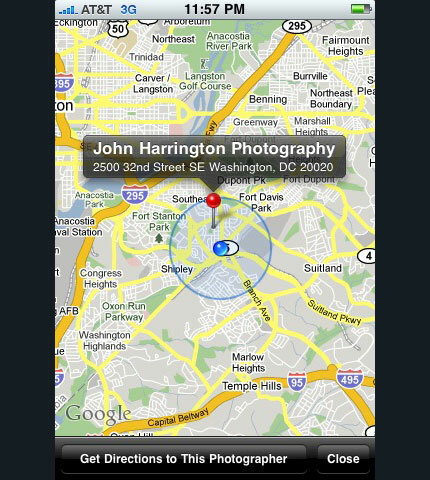 If you're looking for someone that is a retail operation, or studio, and you need to actually go there, the application has a "map" feature, that shows you not only where you are (blue dot) but also the location and address of the photographer's business. 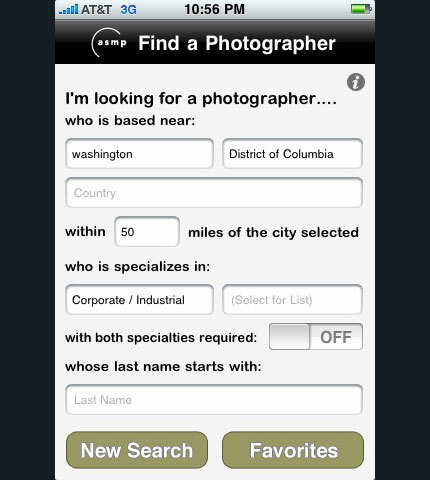 The application is seamless, easy to use, and I pray, will be a download that photo editors and art directors who get those late-night or on-the-road calls from their editors, will use to find a photographer when their rolodex is either empty or unavailable. 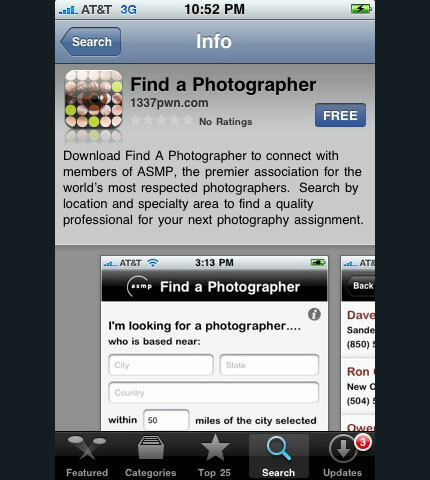 Hats off to ASMP for their thoughtful and well-designed application! For once, someone in the business of providing services to weddings that is NOT a photographer writes about what is needed when hiring a photographer to photograph your wedding. All to often, a writer who has no knowledge of what it means to be in the room for hours on end, behind the scenes, and so on, believes they have captured the essence of being a wedding photographer and what that means - and most importantly, what a prospective couple should look for. Evan Reitmeyer writes on his blog MyDeejay.com, in an article titled Hiring a Wedding Photographer (928/09), about just what the bride and groom should be looking for, by not only asking photographers in the DC and Baltimore areas about what you should watch out for, but he also filters those answers through his BS-meter so that you are not getting marketing gobbly-gook, but rather, a real and thus very helpful answer. If a couple is on a specific budget, what are some ways they can get the most for their money? Each photographer handles the rights to their photos differently. Can you explain the differences? What are the differences between the major styles of wedding photography? What exactly does “wedding photojournalism” mean? How important is it to meet the photographer before you hire them? How important is it to find a photographer that’s a good match in terms of personality, or is liking their photos enough? Are there any advantages of digital photography over film? Are there any disadvantages? How important is it for a photographer to be familiar with the ceremony or reception site? What are the advantages of having a “second shooter” to assist the photographer? Every couple has a “shot list” for family photos, but what are some unique things they can do besides that? What’s the most efficient way to get formal photos completed before the reception? What if the bride and groom really don’t want to see each other before the ceremony? What kind of advice do you give to couples to prepare for an engagement session? What are your thoughts on the current trends in wedding photography, and where do you see things going? In addition, they include a good list of questions to ask a wedding photographer. Evan wrote a great piece - thanks Evan! 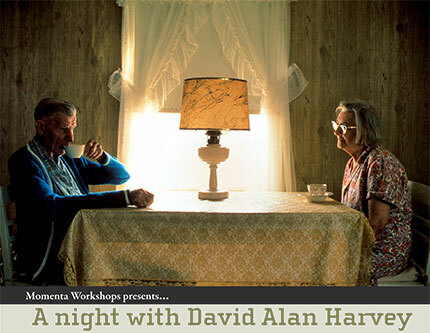 Join legendary Magnum photographer David Alan Harvey and Momenta for a slideshow and party celebrating the American Family. Bring friends, colleagues and co-workers and join us for great photos from our workshop, great music and a great party! Cash bar with beer, wine and drink specials starting at $3.00. Two blocks from the Mission and 16th BART station, 4 Blocks from the Van Ness Muni station or the number 49 bus line runs right by the bar. When: Monday, Sept. 28 - 6:00 p.m. until closing! Doors open at 6:00 with the slideshow at 7:00.